The Model 5925-X Low-Pass Risetime Filters are designed for OEM use in high speed digital networks and telecommunications systems. Filters are available for all SONET, SDH, Fiber Channel, and Gigabit Ethernet data rates. Picosecond can build customer specified -3 dB frequencies from 35 MHz to 10 GHz in the 5915 body and can build customer specified -3 dB frequencies from 6 to 15 GHz in the Model 5925 body. SONET filters for use with NRZ signals should have a -3 dB bandwidth of 0.75 * Bit Rate. These filters are a proprietary, absorption filter design that have attenuation and group delay frequency responses similar to those of the Bessel-Thomson filter. Bessel-Thomson filters filter by reflection and can cause increased bit error rates and eye diagram closure due to multiple reflections. By contrast, our filters filter by absorption. 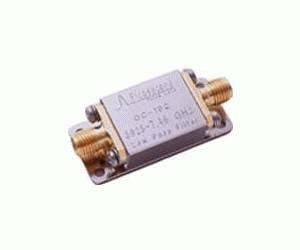 They have excellent impedance matches and very good return losses, both within and above the filter pass band.